The following information is for 2014. A summary of Galway City bus and train services for the over the 2014 / 2015 Christmas and New Year period, and links to official announcements from the bus-companies. 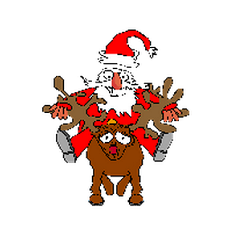 See Regional and National Bus Services for Galway, Christmas and New Year 2014 for bus services outside the Galway City area. Regional bus services in the Galway metropolitan area over the 2014 / 2015 Christmas and New Year period. See City Bus and Train Services for Galway, Christmas and New Year 2014/15 for inner-city bus and rail service information. 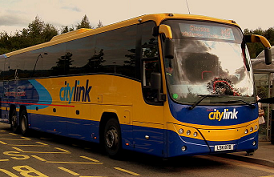 CityLink have announced that the express coach service between Galway City and Killarney, Co Kerry is suspended from 8 December 2014. 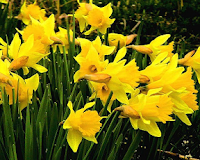 A full service will start again on Monday 2 March 2015. 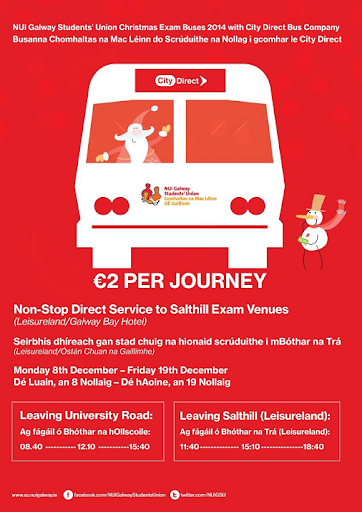 City Direct are bus services between the NUIG Student Union and the exam centre in Leisureland, Salthill for the Christmas 2014 exam period (Mon 8th - Fri 19 December). This is currently the only direct bus service between Salthill and the University. See Getting from A-B in Galway for other direct-journey information. The information below is correct for Christmas 2014 / New Year 2015 only. 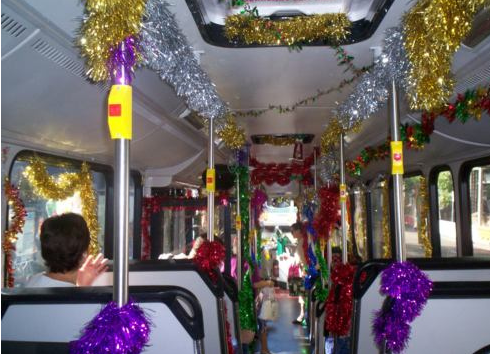 A park-and-ride service will be in place for the 2014 Christmas shopping period. It will operate between Saturday 29 November and Wednesday 24 December, inclusive, and is being run on behalf of Galway City Council by Bus Éireann. On Wednesday 24 Dec, Christmas Eve, the last bus will leave the city-centre in the early evening - the exact time is to be advised, last year it was 5:30pm. Details of December 2014 public-transport fare increases for Galway have been released by the National Transport Authority. 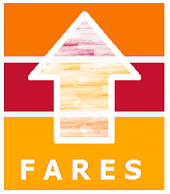 These fares apply from 1 December 2014, for the 2015 calendar year. Monthly and annual ticket prices are being applied during November for tickets that will be used from December. CityLink have announced a winter timetable for the express coach service between Galway City and Killarney, Co Kerry, from Wednesday 1 October 2014. The main bus stop in Farranfore -- this stop is newly added to the timetable. Between October and February, there will be services on Friday and Sunday only, with two services each day in each direction, at 8:30am and 5:30pm. on those days. Currently no other company runs a direct service on this route. 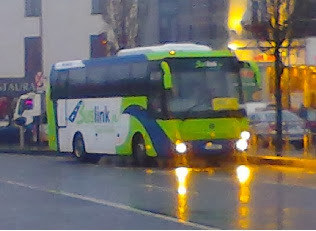 However other regional buses can be used for a non express service with a change in Limerick. 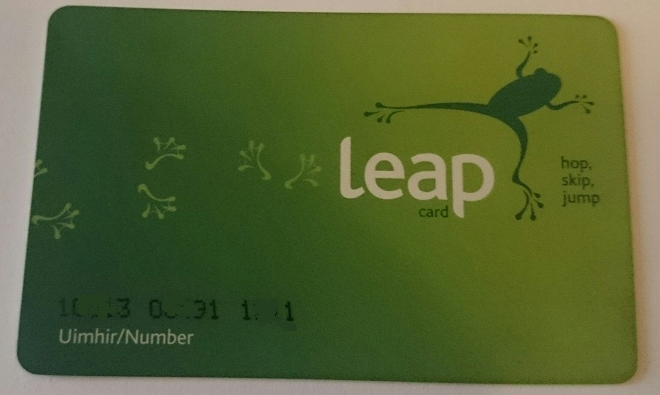 From Sunday 28 September 2014, the LEAP card will be accepted as a way of paying fares on Galway City bus services. 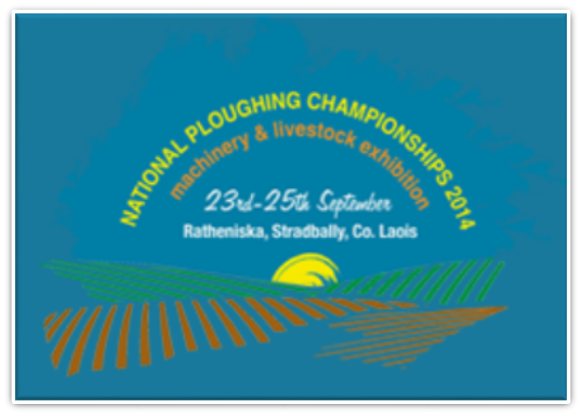 The National Ploughing Championships are being held at Ratheniska, Stradbally, Co. Laois from 23-25 September 2014. Irish Rail are offering a combined rail service between Galway and Portarlington, combined with a bus from there to Ratheniska. Bus Éireann will run a shuttle service to the site from railway stations at Portlaoise, Portarlington and Athy. This service is open to motorists and train passengers, and drops off near the gate to the purple car-park. Note; there is only one shuttle service each day from Athy, meetng the one train from Waterford. Tickets for these services include Bus Éireann services from the nearest station to Ratheniska. Matthews Coaches are running a bus each day from Inniskeen, Dundalk and Drogheda (M1 retail park ). Pre-booking is essential. Collins Coaches Buses on 23, 24 and 25 September, from Monaghan, Clontibret, Annyalla, Castleblayney, Carrickmacross, Ardee. Book on-line through their website. O'Callaghan Coaches are running day trips each day from Killarney. Boyce Travel Centre are running one three day trip from Donegal, leaving on Tuesday and returning on Thursday, includes accommodation. East Coast Coaches are running same-day return trips on Tuesday 23rd, from Belfast, stopping at Lisburn, Banbridge, Newry, Dundalk, Drogheda and Dublin (N2). Pre-booking required. A2B Buses are running a day trip from Tydavnet, Co Monaghan. Details of other services will be added as they become available. Email editor@GalwayTransport.info if you have a scheduled service to add to the list. 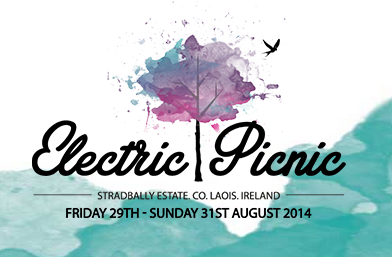 Electric Picnic music / arts / lifestyle festival is being held at Stradbally Estate, County Laois from Fri 29th - Sun 31 August 2014. 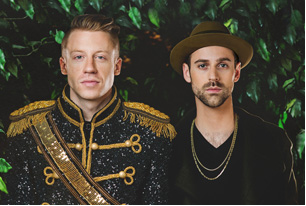 Irish Concert Travel - from Galway city direct. 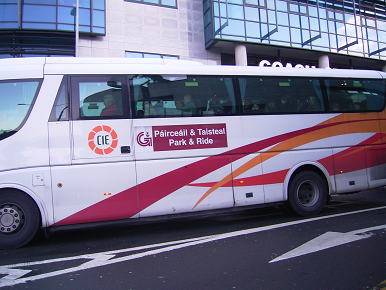 Bus Éireann will run a bus from Galway city at 12-noon on Friday, returning at 10am on Monday. 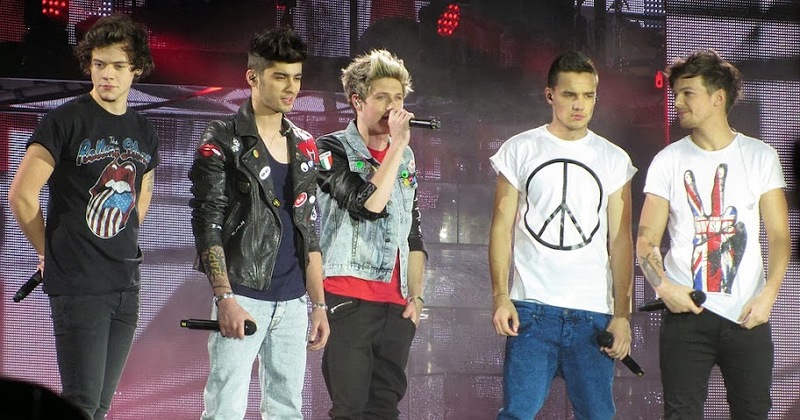 Tickets €35 return can only be purchased in advance from Galway Bus Station - online booking is not available. Kelly Travel are running a service from Ennis, stopping in Loughrea and Kilbeggan. This will run if there are enough passengers - book asap to ensure seats..
Castlebar via Claremorris, Castlerea, Roscommon and Athlone. 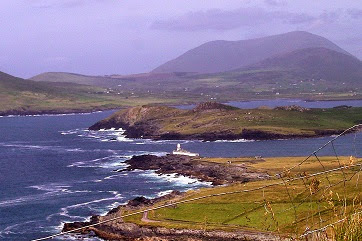 Marathon Travel are running a range of services from Dublin, including day-trips. 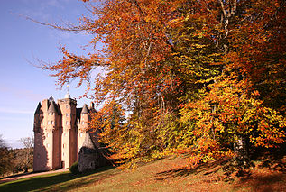 Services do not have to be pre-booked, but are cheaper for bookings. 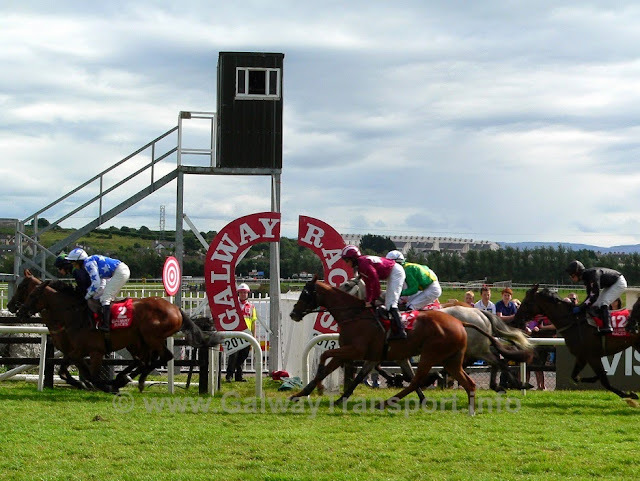 Cork - stopping at Fermoy, Mitchelstown, Cahir and Cashel. Irish Rail have announced special fares from Cork, Dublin and Limerick, but no additional services. 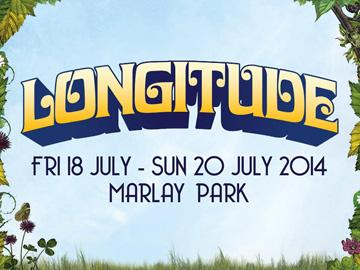 The planned strike action is not currently expected to affect the Electric Picnic dates. 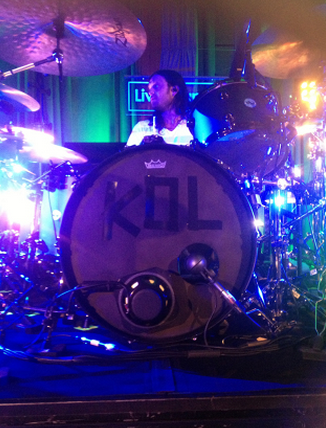 From Stradbally to Dublin Custom House Quays at 2am and 12-noon. Other services will be added to this list as information becomes available - please leave a comment below if you would like a service added. 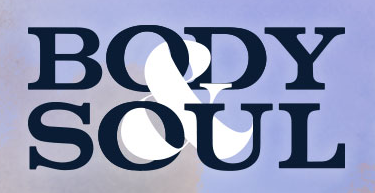 The Body & Soul Festival is being run at Ballinlough Castle, Co Westmeath, from 20-22 June 2014. 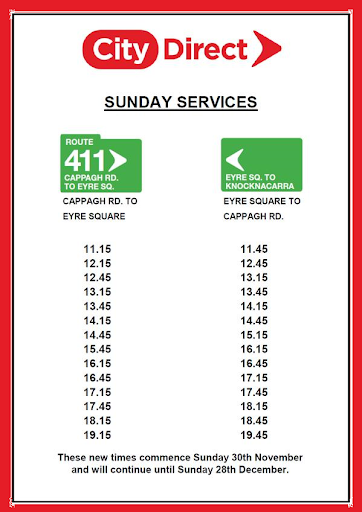 The best alternative is a regular bus service from Galway to Dublin, combined with the dedicated festival buses provided by Bus Eireann - see below. This bus will only run if there are enough passengers - book ASAP to confirm. 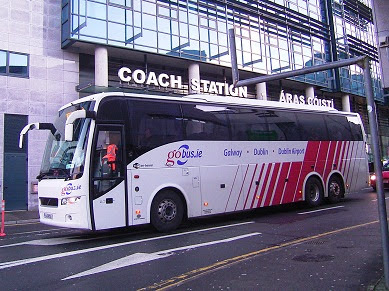 Bus Eireann are running daily buses from Custom House Quay in Dublin city centre. There are combined festival and bus tickets available from www.Ticketmaster.ie. Or you can purchase tickets separately from Bus Eireann. 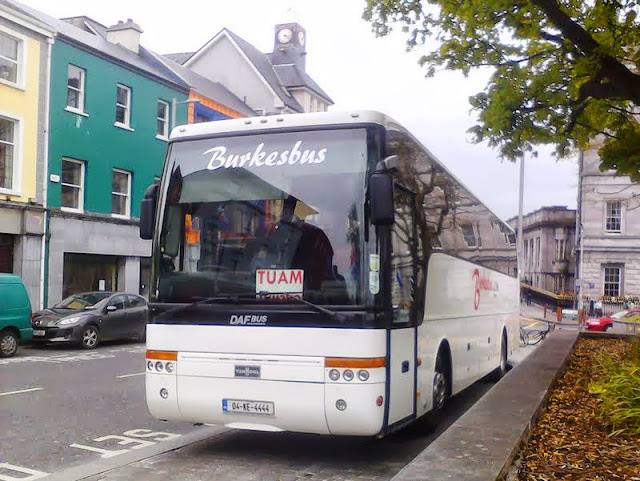 Burkes Buses have announced that from Mon 20 January 2014, the evening Route 435 service from Galway to Ballinrobe / Kilmaine / Shrule and Headford will leave Eyre Square at 5:30pm.